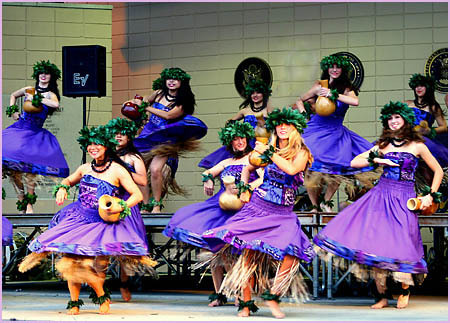 The Barefoot Hawaiian Dance Studio and School conducts classes of dance, music, and other training in various performing arts of the South Pacific, which includes Hawaiian, Polynesian, Tahitian, and Samoan styles. We are proud to own and operate one of the rare minority of schools in the Chicago area and the entire Midwestern United States that specializes entirely in these arts. We have remained devoted to this tradition for over 40 years and continue it today through the training of over 125 students a year in the Polynesian arts. 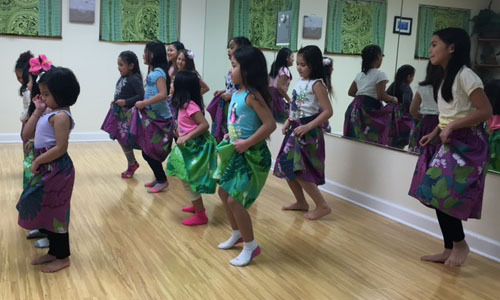 The Barefoot Hawaiian Dance Studio runs three different kinds programs of dance classes. The first and our primary program is our Dance Company Training Program. This is a formal training program for the serious student with the focus on learning the South Pacific dances as a true art form with attention to precision, technique, execution, and showmanship. It is run like a regular school year, broken down into four quarters. Students sign up quarterly and may take from one to all four quarters. The second program is our Summer Dance Classes. Run while our Dance Company Program is on Summer vacation, these are informal dance classes with the focus on having fun and learning basic hula and other arts in a relaxed and casual setting. Students sign up for the Summer program for the classes they are interested in (if more than more than one choice is offered). Our third program is our new Satellite Classes. Created in 2017, it is the equivalent of our Summer Dance program run throughout the year as various and intermittent workshops. It takes the relaxed and informal atmosphere of the Summer program and provides the same throughout the year to students who prefer this style of learning. For complete details of each program and more information that will help you select the track that will suit you best, go to the Program Details section further on this page. Regardless of your selection, you will be taking your lessons from a Hawaiian and Polynesian dance master. Following lists our various dance training divisions and the primary class categories in the divisions. All the divisions listed below, except for Summer Hula, are within the Dance Company Training Program. Summer Hula is the informal program having a stand-alone dance class. The Barefoot Hawaiian is proud to teach children Hula and the art of Hawaiian dance, and teaching young students is one of our specialties. Our head instructor started at age 3 herself and knows firsthand how much fun this can be for children to learn a dance art. For our Keiki classes, children are placed according to age. The classes are designed for students of any skill level within their age group. The performances of our Keiki at public shows is one of our biggest draws, appealing to and providing great entertainment for the entire family. The photos shown in this section is of our Keiki performing on stage at various local public shows. Our Keiki Menehune program is designed specifically to introduce dance to children at the very early pre-school age and into the early grammar school years. Open to both, boys and girls, ages 3 through 5, beginning Hula is taught in a fun and interactive class. Only requirement is that children are potty-trained and ready for a class environment. Our next levels of Keiki dance instruction is a continuing program for school-aged children, boys and girls, up to the teenage years. Our students in these classes take part in full Polynesian dance which includes Tahitian rhythms and the full range of Hawaiian dance arts. Although the classes are structured by ages, Keiki Two and Hoku often perform on stage at public shows together as a large group. The photos shown here collectively depict this. These classes are designed for both, new students to enter the program at any age and for existing students to progress from one age group through the next and from one level (such as advanced and continuing) to the next. So, if you're a parent with an older child, our program can accept your son or daughter as a brand new student. These Keiki classes are for teenagers, boys and girls, ages 13 through 16. As is true for all our Keiki classes, new students are always welcome to enter the program. So, if you're a 15 year old boy or girl with a brand new interest in Polynesian dance, our program can accept you as a brand new student and learn for the first time. For our students that have progressed from previous classes, they will learn advanced techniques covering the full range of Polynesian dance arts. In addition, for those students wishing to continue on, these classes prepare students for entry into one of the adult classes where they will be later placed according to their skill level. These Barefoot Hawaiian dance lessons are for women ages 16 and up. The Wahine (Non-Pro) class offers a range of the Hawaiian dances in a fun and hang-loose setting, yet with the discipline that provides confidence to perform on stage. Many of our Wahine dancers perform at our public shows and with great appeal. Wahine (Non-Pro) is the perfect division for ladies who wish to learn and perform but not commit to the rigors of advanced and professional dance training. Wahine (Non-Pro) has three levels: Wahine I covers from newcomer and beginner through the 2nd year of experience and training. Wahine Continuing I are for those with 2 or more years of training and feeling comfortable to move on. Wahine Continuing II are for those with at least 3 years of training and feeling comfortable to move on. The multiple levels offered in this non-pro Wahine class allows women to advance and continue their training without the pressure to move into the Company Professional division or the performances that accompany that division. The Barefoot Hawaiian offers a Wahine class focusing strictly on Tahitian dance technique. This is an advanced and challenging class designed for ladies with previous Tahitian dance experience. The professional dance division of the Barefoot Hawaiian Studio and School is the graduate-level program in the world of Polynesian dance. These classes are highly advanced in nature and designed for the field of professional entertainment. Training is both challenging and demanding, and classes should be attended by serious students only. Focus is on perfection of technique and timing, precision and execution of the dance, and on exhibition and showmanship, all of which our clients expect from our professional entertainers. This class is for women who wish to become professional entertainers and for current performers wishing to advance their skills. Females interested in becoming performers for the Barefoot Hawaiian should be attending these classes. All current female professional performers of the Barefoot Hawaiian dance company are required to attend the Wahine class in order to retain their professional status and regularly recertify their professional qualifications. This class is for men who wish to become professional entertainers and for current performers wishing to advance their skills. Gentlemen interested in becoming performers for the Barefoot Hawaiian should be attending these classes. All current male professional performers of the Barefoot Hawaiian dance company are required to attend the Kane class in order to retain their professional status and regularly recertify their professional qualifications. Maori Poi Balls is the specialty dance from New Zealand involving control of bound cloth balls swung from the end of cords operated from both hands. This dance teaches incredible hand and eye coordination and control. This is the same Maori Poi Balls class described above but is designed specially for children. This is a children's class similar to our regular Keiki classes except this is specifically for and is restricted to boys. Boys age 4-12 learn the movements that are more specifically performed by Hawaiian males. Learn the dance techniques of the Islands of Tahiti. Strenuous and high energy; your will learn the terms and execution of Ori (Tahitian technique), working up to a performance routine. Open to adults (men and women) and to older children (boys and girls) ages 11 and up. Samoan Fire Knife, a/k/a Siva Afi - "Dance of Fire." 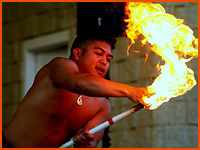 Learn the specialized art of the spectacular Fire Knife Dance, an art form originating from Samoa designed to simulate tribal warriors in battle. Students in this class will learn technique and precision in twirling and movement. Available to adults ages 16 and up. When offered, this class offers a special and unique opportunity for a mom and her daughter to bond while learning the hula together. This class is for mothers and their daughters age 5-15. Learn the dance techniques of the Islands of Tahitiin in a workout manner. This class will also teach the terms and execution of Ori, a Tahitian technique. This is a strenuous workout class for girls & women age 12 and up. Focusing on the people and history of Old Hawaii, this class is a journey into the past of songs, beliefs, customs, and rituals. 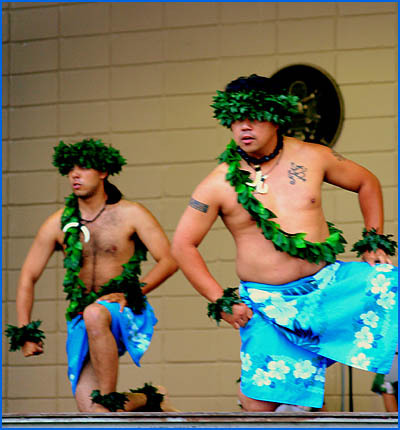 Students will also learn in this class the ancient dance of Hawaii: Kahiko Hula. This class is open to adult men and women age 16 on up. Learn Tahitian drumming. Available to adults and children from ages 13 and up. Drumming is a 45 minute class. The Ukulele is the Hawaiian musician's primary musical instrument, and the word translates literally "jumping flea." We welcome students from all skill levels, including the beginner and the first timer. Ukulele is a 1 hour class. Each student must have his (or her) own ukulele. Where a class is combined for both adults and keiki, children must be age 15 and up. Where we offer separate Adult and Keiki classes, Keiki classes are for ages 8-15. Adults classes are for 16 and up. Discover the Harmony, Unity, and Gratitude of Aloha (HúGá) in this Barefoot Hawaiian exclusive class that combines the techniques of both Hula and Yoga. Experience the piece and joy that awaits you and connect with your inner self. This class is available to men and women, ages 16 and up. Participants should dress comfortably and bring a towel and a mat (or other suitable floor covering or padding on which to sit and lie on). This is a gentle exercise class. When in operation, HúGá classes operate and are in session during our regular quarterly class schedule, but attendance and registration are different. Unlike our regular performing art classes which operate under a formal registration and committed attendance, HúGá operates informally and without the need for registration or even regular attendance. You come to HúGá sessions when you can. Simply purchase an "8 Session Punch Card" for only $88 (cash or check). The punch card is good for the entire school year and may be used for any classes held throughout. For Halau Member adults only, ages 18 and up, learn how to run a Polynesian show, make announcements regarding the details of the show, engage the audience and keep them interested. This class is available to our Halau Members only that meet certain experience requirements. Some of these classes may not run by a regular schedule and are offered only at certain times based on the number and progression of advanced students for which these classes are available. Admission to some of the advanced dance classes may be by invitation only to advanced students of the dance company who have demonstrated a proven proficiency in the Hawaiian and Tahitian techniques. Note: Unless specified otherwise all dance and dance-related performing art classes run about 45 minutes in length. When our dance company training program is on summer vacation, we continue with a variety of informal classes during the summer. The summer program is all about fun and are the only classes we offer that is not a part of the Barefoot Hawaiian dance company training program. Anyone can learn hula, and you will do so in a relaxed and informal environment without need for previous training or experience in any dance form. No high expectations from students. No costumes or special equipment or apparel needed. This class offers an excellent way to introduce you to this beautiful form of dance. The classes are comprised of 4 to 8 lessons: one lesson a week over a 4 to 8 week period. It runs when our formal dance company training program is on Summer Vacation. Enrollment is informal and simple. You simply download a flier with registration form from this web site, fill it in, and return it with your class fee. That is all there is to it. Look below under the Class Schedule section for the class dates and the downloadable form. This classes may be offered to a variety of age groups. See the summer schedule for the age requirements of any specific class. 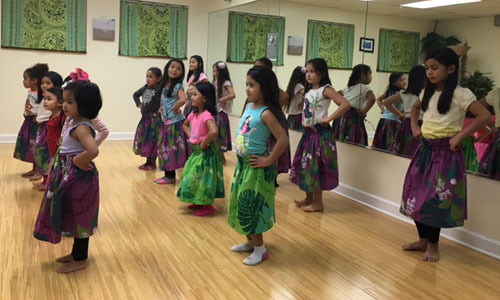 The Barefoot Hawaiian Dance Studio and School runs its dance company classes similarly in schedule to that of any formal school of education. The training year runs from Fall through Spring and is divided into 4 quarters of 8 weeks each (except for certain specialty classes denoted below). Each quarter offers a different curriculum of classes and levels from which the student will be placed. Classes run evenings during the week from Monday through Thursday and during the day on Saturday. The exact day and time depends on the class for which you will be enrolling. The detailed schedule along with tuition for each class is provided in the curriculum and registration packet. In addition to our regular dance company training year we also offer a summer program. The summer classes are basic hula for adult women (age 16 and older) and are intended for fun with the classes being more laid back and relaxed. Enrollment for the summer programs is also much simpler. Company/Professional Level I (7:45-8:30) ¹, Company/Professional Level II (8:30-9:15) ¹. Status: This quarter has ended. ¹ These classes require prerequisite training and experience and are restricted to invited students only. ² These classes have multiple days and times being offered. When registering, specify the day and time slot you prefer. The Dance Studio is closed and no classes will be held for the 2 week period from December 23 to January 5 for the Christmas through New Year's Holidays. ² These classes have both a Monday night and a Tuesday night offering. When registering, specify the night you prefer. Status: This quarter is now in session. Enrollment is now closed. or join one of our many satellite classes that are ongoing or join a Summer class, program to be announced in May. Thank You. Flier from 2018 Summer below is left up for reference only as to what we did last year. Satellite Classes is the newest addition to our class curriculum. They are similar to our Summer Program in that they provide a variety of classes that is less formal than in our quarterly-based school year structure, but they run in parallel to the 4-Quarter School Year classes. Think of it as continuing education night classes in a college without the need to feel pressured to commit to seeking a degree. These classes are about fun and learning and you can take them as your schedule permits. No need to feel that you must commit to a full school year or even an 8-week Quarter as most classes are 6 weeks and under and some are single classes. Learn the art of Maori Poi Ball swinging. Download the flier below for the details and to register. This is a unique workout class focused on exercise in an environment of ultimate fun. Or attend classes individually at the weekly drop-in price of $10 each. For Teens and Adults ages 12 and up. The following class was cancelled due to the minimum number of registrations needed not being received by the required registration date. Avoid future disappointments in classes of interest in by registering before the registration deadline, or better still, registering well in advance. Thank you. Learn the art of Tahitian Drumming in this fun class that requires no previous experience or even your own equipment. Everything provided while in the class. Due to limited space and to plan for needed equipment, registration deadline is March 1. This adult wellness class which combines Hula and Yoga will have you discover the Harmony, Unity, and Gratitude of Aloha (HúGá) that lies within you. The class originally scheduled for April 10 was cancelled. Note this change is not reflected in the flier below. Available, only if class is not filled, is weekly drop-ins at the regular price of $10 each. Not a a Hula class, it's 45 minutes of moving to music that is for fun and for fitness. This is a calorie-burning, low & high intensity mix, aerobic Hip Hop dance class. 45-minute classes, Sundays, 11:30 AM - 12:15 PM. A total of 6 classes running from May 5 to June 9 for $55. For persons of all ages. Because of the specialized training each student will get, and minimum class size requirement of our professional trainer, early registration is strongly encouraged. There is also a maximum number of students that will be accepted. Registration closes April 27. Don't miss out on this all new class. For Adult Women only, ages 18 and up. Note: If you are not yet completely familiar with our dance studio and training programs, please first read the Program Details section on this web page, before reading about the particulars of actual enrollment. The enrollment procedure varies only slightly depending on whether you are an existing student or a new student. In either case, pre-registration for all classes and students is required. Once the class begins or becomes full, enrollment closes. For both existing students and new students, enrollment for the new training year commencing in Fall opens in late Summer. During this time there is an open enrollment period whereby students must be admitted in person. The dates for this open enrollment period are shown in the above Class Schedule and scheduled during the summer. Although, general enrollment for the training year occurs in late summer, specific class assignments are made at the beginning of each quarter. Class assignment and choices is determined between student and instructor and is usually based upon the student's progress and current skill level. Tuition for each quarter is due before the start of each quarter according to the tuition deadline date in the schedule. Please note that there are limits on the class size, and all classes offered through the Barefoot Hawaiian Dance Studio always fill to capacity. Early registration is recommended and encouraged. A class curriculum and enrollment packet is mailed (1st class postal) each summer to all current students of the Barefoot Hawaiian Dance School. If you do not receive this packet by the first week of August, let us know. We will get one to you promptly. Also watch your email. Email notifications as to when the enrollment packets will be mailed are sent to all students with email addresses. Student will complete the information section of the registration form and the consent form and come to the studio with the completed forms during the open enrollment period. The purpose for the in-person registration to get each student properly placed in his or her appropriate class based on skill and advancement level. Students under 18, must arrive with a parent or guardian. Tuition for the 1st quarter is due at the time of registration. Tuition for subsequent quarters are due before each quarter starts by the date indicated in the class schedule. The Barefoot Hawaiian openly welcomes new students to our dance company. If you are a new prospective student interested in admission to the dance company and entering its training program, please call us at 847-699-7336, and we will mail out a full curriculum and enrollment packet when they are available for release each summer. Upon receipt, complete the student information section of the registration form and the consent form and visit the studio during our open enrollment period in the same way that existing students do. Students under 18, must arrive with a parent or guardian. The free, in-person consultation is to ensure you are properly placed in a class appropriate for your gender, age group, style, and skill level and exists to ensure success and satisfaction with our students. Please note that we open admission for new students for the 1st and 2nd quarters only of each training year. Only existing students may continue on with the training for the 3rd and 4th quarters. This is to maintain the best and highest quality dance training program for our regular student body and so we can focus on more advanced training during the 2nd half of each school year. If you are wishing to join us as a new student, you must do so by the 2nd quarter. Enrollment for the Summer Classes and the Satellite Classes are extremely informal and easy. When the schedule for this class is announced, a flier and registration form will be available for download from this web site. Look for the link to this downloadable form under the class schedule. Simply complete the form and mail in with the appropriate class fee to the Barefoot Hawaiian, or stop by the studio or store and drop it off in person. When received and processed, we will notify you with a confirmation of your enrollment. 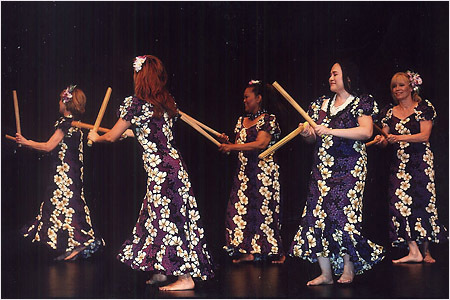 The Barefoot Hawaiian is foremost a Performing Arts Dance Company. As such, the majority of our training is to students who our members of that company. Our dance students range in age from 3 years all the way up to upper-aged seniors. The skill level of our students range from beginners all the way up to our world-class professionals that perform at our top-flight shows. In fact, everyone of our professional dancers must maintain a regular and rigid training program as a student in order to maintain their status as one of the professional dancers in the company. Many of our non-professional students are seen demonstrating their skills by performing on stage with us at our many public shows. These performances are extended to our students by invite only. Performing on stage is not a requirement to become a dance company student, but most accept the invite when offered. Setting a personal goal to perform on stage is usually the reason individuals choose to join the dance company training program, and getting the opportunity to do so is viewed as a major accomplishment. Some continue on to become proficient enough to join our cast as one of our professional entertainers. Our professional dancers are paid performers. Only our professional division dancers perform at private parties for clients or clients hosting a public show, but wanting only professional performers. The dance company training program is run just like any school of education with classes divided into four quarters of 8 weeks each that run from Fall through Spring. Enrollment into the training program opens in late summer and students are expected to attend for a complete school year of all 4 quarters. Tuition is paid on a quarterly basis and is due before the quarter starts. Like any real school, there is an enrollment and admission procedure, which is described in the Enrollment Procedure section of this web page. The training provided in the dance company program is more advanced than you will find available through the dance classes at junior colleges and most 4-year colleges. 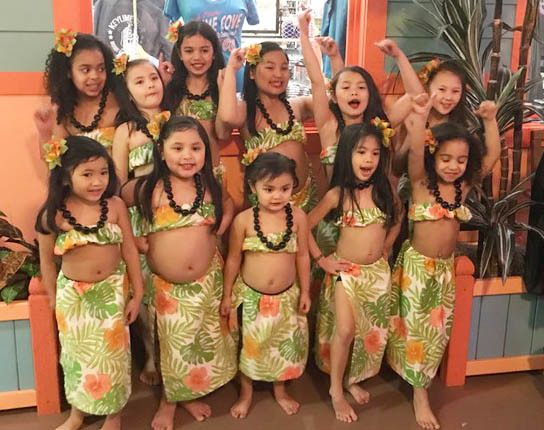 The Barefoot Hawaiian runs the only hula and Polynesian arts dance studio in the Chicago area that provide a high level of training and that instructs at the professional entertainer level. We are one of the few schools in the entire Midwest that specializes in the Hawaiian and South Pacific dance arts. The descriptions provided in the Class Description section on this page, except for the last, are for the dance company training program. The portraits shown are of a small segment of class photos of our students in one of their performance costumes. Want to learn hula in a fun, relaxed, informal environment? Then this is the class for you. No previous training or experience is required. No high expectations from our students. No costumes or shows. Just quite simply a fun way to learn beginning hula and other Hawaiian arts and receive an introduction to this beautiful form of dance. The Summer Program classes ranges from 4 to 6 lessons, over a 4 to 6 week period and runs when our formal dance school is on Summer Vacation. The Satellite Program classes ranges from 1 to 6 lessons, over a 1 to 6 week period and runs concurrently with and when our formal dance school is in session. Unlike our dance company classes, enrollment is informal and extremely simple. You simply download a flier with simple registration form from this web site, fill it in, and return it with your class fee. That's all there is to it. Many discover the fun of hula and other Hawaiian arts in these classes, so much so, that they continue onto enrollment into the dance company classes. But how far you go is completely up to you. Your decision to become a dance company student depends on your personal goals and previous dance background. If you have little to no previous dance experience but are strongly motivated to learn hula and can make a commitment to regular class attendance, then this program is for you. Once you learn hula you can progress to Tahitian and other dance forms. If you are an individual with experience and training in other forms of dance, and now wish to commit to learning the South Pacific styles, then joining our dance company program will provide you the greatest reward. For parents looking for dance lessons for their children, we also recommend this program. Our dance company program provides the structure that young dancers need by which to learn; moreover, it provides a discipline that serves the young minds well in many other areas of their lives. At present, only our dance company program has classes for children. If you are not certain if the dance company program is for you, consider first joining the Summer Hula Dance Class. Then if you fall in love with dancing hula, you may be able to enroll into the dance company program the following Fall. The summer Hula Class is also the best choice if you do not wish to commit to the longer dance company training schedule, or if you have only a one-time interest in hula, such as for an upcoming luau, a Hawaiian-themed wedding, or other similar occasion or special event.